For holidays, we always spring for special crackers. We have our year-round go-to favorites, but a special occasion deserves special crackers with the hors d’oeuvre, soup and cheese courses. 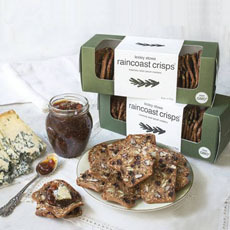 Raincoast Crisps is one of the finest cracker lines made. 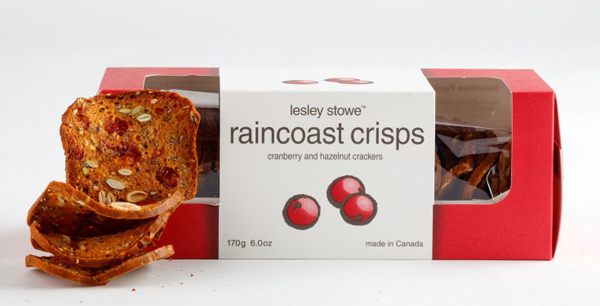 Lesley Stowe spent years as a caterer before the demand for her crisps grew so great, she realized there was a different opportunity to pursue. She went into the crisps business full-time. Perfect for antipasto, dips, cheeses, pâtés or eating by themselves, these crisps are a perfection of flavor, texture and eye appeal. They’re packed with seeds (flax, pumpkin, sesame), nuts, fruits and herbs. There are now six year-round flavors and a pumpkin edition for the holidays. These small batch crackers* are made from scratch, using the finest-quality, all non-GMO ingredients. While Lesley could make them flat naturally, she creates a slight curve in the crisp to make them even more special (and great for dipping). Much time was spent in the development of Raincoast Crisps. There’s a lot of hand labor required to get them just so. As a result, they’re pricier† than production-line crackers. But as a splurge, don’t hesitate to spend your money on them; they’re worth it. The products are certified kosher by OU. *In the U.K. and Canada, crisps are something small and crunchy. Potato chips are called potato crisps. †We have seen them for $7.99 to $11.99 for a 170 g (6-ounce) box, depending on the retailer. As a caterer, Ms. Stowe had the experience to develop cracker flavors to pair with popular nibbles. Her choices follow, although your own preferences should guide your way. 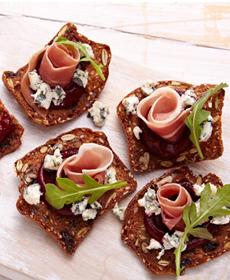 TOP PHOTO: Use Raincoast Crisps as the base for canapés. BOTTOM PHOTO: The flavors and textures of Raincoast Crisps. Photos courtesy Lesley Stowe. 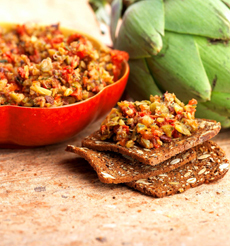 While you’re at it, check out Lesley’s recipe for Caramelized Onion & Blue Cheese Dip. We couldn’t get enough of it. There are also two flavors exclusive to Whole Foods Markets: Apricot Fig & Lemon Crisps and the seasonal Pumpkin & Spice Crisps. There’s a store locator on the website, and they are sold online at Dean & DeLuca, iGourmet and other specialty food sites. However, reading the reviews on Amazon raised an issue we need to point out. While almost every comment called them the “best crackers ever” (while bemoaning the high price), the majority reported that the crackers arrived in crumbs, that the packaging wasn’t good for shipping. We can’t think of a better holiday gift for a foodie—along with a fine piece of cheese. 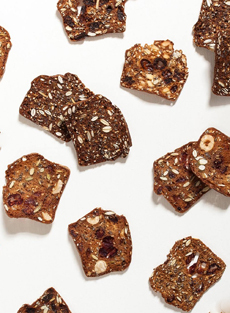 Cranberry Hazelnut Crisps photo courtesy Dean & DeLuca.